Nigel Ackland can open beer bottles, pour drinks into a glass and delicately crack eggs into mixing bowls. So far, so normal. But the former precious metals smelter, who lost his right arm after an accident involving an industrial blender, tackles these tasks wearing a prosthesis, the bebionic3. 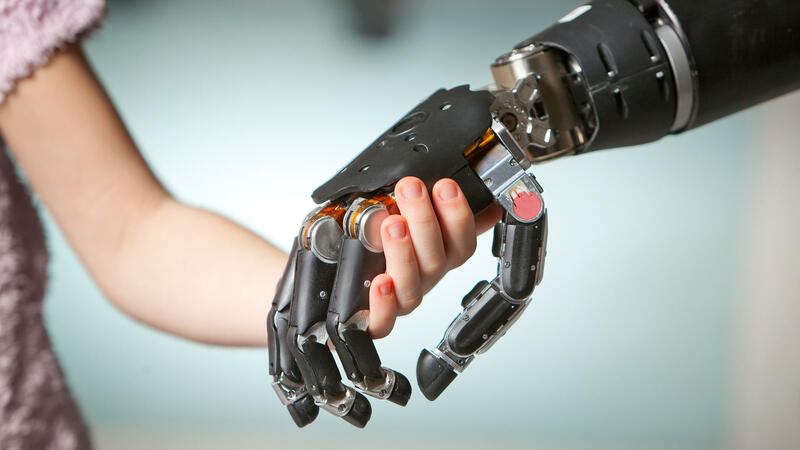 The bebionic3 is manufactured by RSLSteeper, a Leeds-based assistive-technology company, and is the latest incarnation of a versatile and realistic artificial hand it first developed in 2009. Electrodes in a socket that fits over the user’s stump detect changes in voltage caused by the remaining muscles contracting and relaxing, and send signals to a CPU built into the unit. This controls servo motors in the four fingers and thumb, which change the hand’s shape. The CPU on the hand monitors each finger’s position through the rotation of its motor, enabling the hand to take up the shape of the object it is holding. “Every finger knows where the other fingers are,” says Rattray.This versatility leads to some impressive manoeuvres. Ackland can type, pick up heavy objects and beckon someone, and be adept in the kitchen, all by contracting and relaxing the muscles in his upper arm.